Welcome to the Infection Prevention and Control Department. Grand View Health is committed to patient safety. 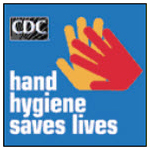 The most important step you can take is to wash your hands with soap and water or use an alcohol based hand sanitizer. The Pennsylvania Department of Health (PADOH) monitors influenza activity throughout the year, but ramps up surveillance activities in the fall and winter. The official influenza surveillance season starts with the 40th week of the year (typically around the beginning of October) and ends on the 20th week of the following year (in May). For the 2015/16 season, the influenza surveillance season began on October 10, 2015 and will run through May 21, 2016. Updated influenza activity data will be posted on their web page every Tuesday throughout the influenza surveillance season. You can check the updates here.